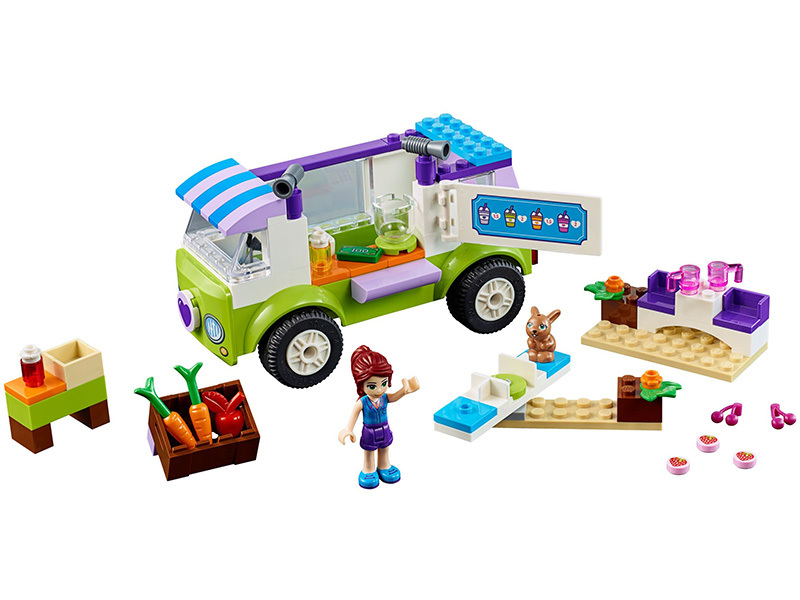 Start the day out right with goodies from Mia’s Organic Food Market, featuring an Easy to Build truck with Quick Start chassis, opening side and rotating sign, plus a spinning merry-go-round, stand-alone crates and a picnic table with seats. This colorful and fun toy also includes a simple guide to build and play, with bigger starter pieces to help build confidence in younger children. Includes a mini-doll figure and bunny figure. Includes a Mia mini-doll figure and a Twister bunny figure. Features a colorful, Easy to Build truck with Quick Start chassis, opening side, rotating sign and space inside for a mini-doll figure. Also includes a crate, small table stand, buildable merry-go-round and a picnic table with seats. Accessory elements include a crate, 2 carrots, 2 cherries, 3 strawberries, 2 cups, an apple, honey jar, strawberry jam jar and a money bill. This fun toy is an age-appropriate build and play experience for ages 4-7. Food truck measures over 3” (8cm) high, 5” (14cm) long and 2” (7cm) wide. Picnic table measures over 1” (3cm) high, 2” (6cm) wide and 1” (3cm) deep.